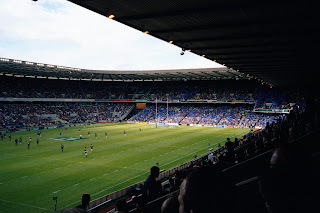 On Sunday 22nd May 2005 the tenth edition of the Heineken Cup final was staged in Scotland for the first time. 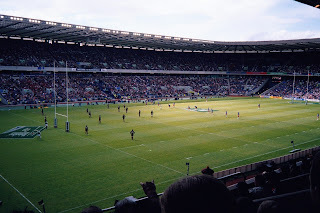 The only appropriate setting in Scotland for a rugby event of this magnitude is of course Murrayfield Stadium in Edinburgh, the home of Scottish rugby. 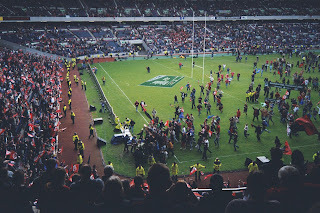 The Heineken Cup is the Champions League of rugby union, a competition in which the best club teams in Europe battle it out to be crowned the best club team in Europe. 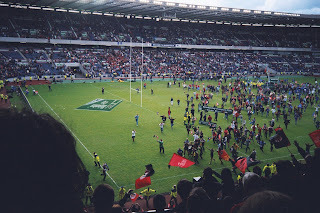 After the humble beginnings in 1995 (when no English or Scottish clubs participated) the Heineken Cup has evolved to become the biggest club competition in world rugby. The two teams in the final were Stade Toulousain, commonly known simply as Toulouse, and Stade Français. I had bought the tickets for this final months in advance and when it turned out that the two teams participating in it were both from France I was slightly disappointed. I had hoped to see at least one British or Irish side in the final to increase the chance of a sell-out final. Also I feel it is never a good thing if two teams in a European final, whether it is in rugby or in football, hail from the same country. The atmosphere is different, and also I feel it is less appealing for the neutral viewer. Moreover I had wanted to see one of the bigger teams in European club rugby I had never seen in the flesh, like Northampton and particularly Leicester Tigers. I need not have worried. Although the final was not sold out, a respectable attendance figure of 51,326 was by no means an embarrassment for the organisers. Especially the Toulouse fans created a magnificent atmosphere. Toulouse is a city in the southwest of France, very much rugby heartland, and their supporters were as loud and colourful as the most partisan football fans. The Parisians who rooted for Stade Français were a lot quieter. As always when I go to Murrayfield I had gone for the cheapest tickets. The difference in price for different sections of the ground is staggering and the dearer tickets usually cost about three times as much as the cheapest ones. The £15 tickets I had bought were perfect for me. 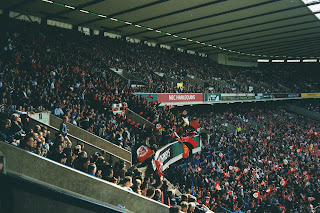 We were close to the vocal Toulouse fans and we started supporting Stade Toulousain more and more as the game went on. The game was a thriller without any tries but plenty of suspense. After 80 minutes the score was 12-12 (after a late Toulouse penalty) so extra time was required. It remained a kicking game in extra time and another penalty and a drop-goal were enough to earn Toulouse their third Heineken Cup trophy. The blue-clad Stade Français fans in the opposite corner. The partisan Toulouse fans luckily were in our corner. 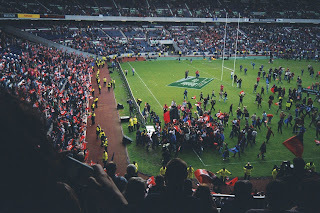 Winning the Heineken Cup for a third time sparked joyful scenes. The Toulouse players celebrated in our corner. Note the many blue Stade Français flags but I did not notice any nastiness between the two sets of supporters. I am a Dutchman who has lived in the west of Scotland since 2001. On this site I intend to give an overview of the football grounds I have visited. The grounds I have visited are listed below. Especially in the Netherlands it is common that stadiums are named after sponsors. This means names can change regularly. If names have changed I use the name the ground had on the day of my last visit. You can contact me if you have any questions, comments or suggestions or just leave a comment under any post. Football is more than just a game!